Very good value, exceptionally easy to operate. Slightly plain looking - however for the price you can't argue. Finished is a smart white exterior, with a black stripe to the front, the Akai A24001 is the ideal solution for those looking for an inexpensive yet functional solo microwave. In terms of power and size, the A24001 microwave is fairly middle of the road - offering a 20 litre capacity and 800w of power. The controls are dial based - simply set the mode on the upper dial, the timing on the lower, and you're good to go. 6 different power levels are included, from defrost ranging up to high, and the timer goes up to a maximum of 30 minutes. The interior features a generous 24.5 removable turntable. Standard features such as a push button door and a child safety lock are also built in. This microwave is ideal for those on a budget who are looking for a simple method of heating and cooking food. It may lack the features of high end models, but for the money you can't argue. The controls are very easy to operate, and overall build quality is pretty good. 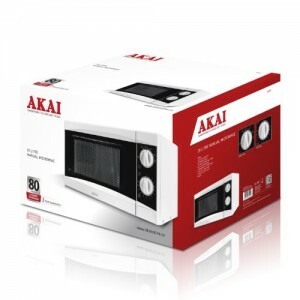 The A24001 is an easy to use solo microwave from Akai, which is has a cheap price tag yet is still pretty functional. Simple to operate, and offers good value. Thanks for your question – the interior uses of the Akai A24001 uses an acrylic finish, which is simple to wipe clean after use. is the defrost the first button on the left ?